Along with its impressive and awarding winning interpretive building, the Environmental Discovery Center features 60 acres of restored and created native ecosystems including ponds, wetlands and prairies. Winding through the ecosystems are three short paths known as the Discovery Trails with interpretive panels scattered along all of them. The Pond Promenade is only 123 yards long and skirts the Discovery Pond that the center towers over and its tunnel and glass viewing room provides a underwater glimpse of. In the beginning it passes a marsh where there is an observation area into what’s hopping, croaking or swimming in the wetland. Another observation area is located on the south side of the pond. The Lupine Loop is a 0.2-mile walk through a short grass prairie that climbs gently to Outwash Overlook where you can see Lower Pond and the sedge fen that borders it. Near the end you have an opportunity to extend the hike by following the first trail to the observation areas on Lower Pond or the second to a native plants garden and sundial. Turkeyfoot Trail is basically a crossover trail that reduces Lupine Loop to 905 yards by bypassing the climb to Outwash Overlook. The Meadowlark Picnic Area has two shelters that can be rented along with tables, grills, a wood playscape, volleyball court and horseshoe pit. Adjacent to picnic area is Spray N’ Play which children can get soaked in the water spray area, climb a rock wall or a cargo net, or find their way through a maze. The toddler area includes a painted labyrinth and a sand pit with oversized scoopers for digging. Indian Springs also features a 6,707 yard, par-71, 18-hole course 18-hole regulation golf course (248-625-7870) with a driving range and club rental. Completed in 2005 at a cost of more than $12 million (which included the Spray n’ Play park), the Environmental Discovery Center is a showcase interpretive area with a flaw. 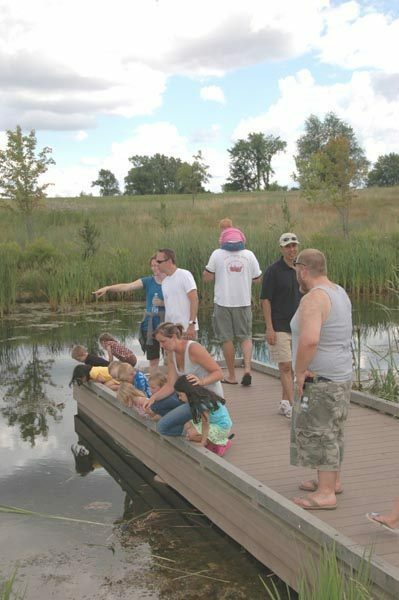 The facility overlooks a man-made pond and it most notable feature is a tunnel and glass viewing room that was designed to provide visitors a below-the-water view of pond life, including native Michigan fish and plants. But an algae problem in the pond has resulted in visibility of usually less than a foot and most people leave the room seeing little if anything. Still the wetland exhibits on the top two floors are interesting and make for a good place to start for families with young children. Indian Springs is open from 8 a.m. to dusk daily and the Environmental Discovery Center is open from 9 a.m. to 8 p.m. Memorial Day to Labor Day and 9 a.m. to 5 p.m. the rest of the year. The Spray N' Play is open year round, with the water spray area open Memorial Day to Labor Day. A vehicle permit fee is required to enter the park. The park can be reached from M-24 (Dixie Highway) in Clarkston by heading west on White Lake Road and following the park signs 5 miles to the posted entrance along White Lake Road. It can also be reached from M-59 by turning north on Ormond Road and then east on White Lake Road. Contact the Environmental Discovery Center (248-625-6640), the park office (800-477-3192) or the Metroparks Authority at 800-477-2757 or (www.metroparks.com).